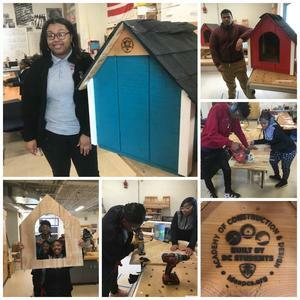 Scholars sold some of the dog houses to teachers and local families and donated the rest to DC's animal shelter. While they prepare to work on rehabilitating a house for people, ACAD scholars practiced their skills building houses for dogs! Scholars in Mr. Milne's class worked together to measure, cut, assemble, paint, and roof the houses. Each one is emblazoned with the Academy of Construction and Design Built by Students insignia. Look for more products with this seal throughout our community!